The AVR-E family offers medium-to-high voltage pulses with very fast rise and fall times. The AVR-E1 series provides peak outputs to 20V, with pulse widths variable from 20 to 200 ns, with pulse repetition frequencies to 200 kHz, and rise and fall times of 300 ps. The AVR-E2 series has similar pulse width ratings, but offers a higher maximum amplitude of 50V, with 500 ps rise and fall times, and a maximum PRF of 100 kHz (or 10 kHz for an extended pulse width option). A delay control and a sync output are provided for scope triggering purposes. The units can also be triggered externally using a TTL-level pulse. Either output polarity or an optional dual output polarity can be provided. Polarity inversion in dual polarity units is accomplished by means of a two-position switch. A DC offset or bias insertion option is available. 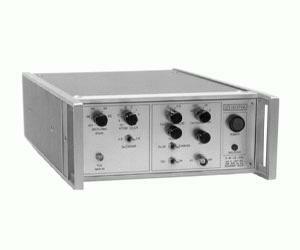 “-C” models can also be supplied with voltage controlled output pulse width and amplitude options (0 to +10V). Units with the electronic control option also include the standard front-panel one-turn controls.